The World Cup is just around the corner. How will you be watching football’s showpiece event? Perhaps at the pub, maybe while at work? The best way would be to watch it from the comfort of your own home with the ultimate setup. Imagine money was no object and you could spend without thinking twice, like Chelsea owner Roman Abramovich. What TV would you have? Would you go for a projector? But what about sound, and cinema seating? Then don’t forget about how you’ll clean up the mess afterwards. There are gadgets at the top of their game for everything you need. Watching the greatest football tournament in the world in style should be the only way to do it this year. This is a guide to the ultimate fantasy football AV set up that only a Russian oligarch can afford – with a few alternative options thrown in for the rest of us. Let’s begin with the TV setup which is arguably the most important place to start as your window into the matches of the World Cup. One of the best TVs you can get is the Bang and Olufsen BeoVision Eclipse. An elegant design is the big sell but this also boasts the latest in 4K HDR OLED screen tech. The BeoVision Eclipse is a beautiful piece of tech, inside and out. 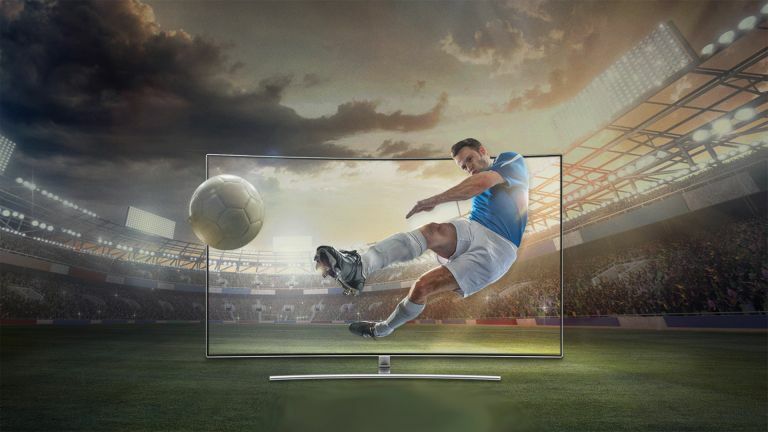 Featuring what the company claims is the world’s best TV sound, you’ll be able to hear every tackle being made as if you’re on the pitch yourself. Available in either 55 or 65-inches, the BeoVision Eclipse offers an array of customisation for a more personalised appearance. Price depends on preferential customisation but you’ll be looking at £7,500 and upwards for the base model. Alternatively at a much cheaper price the 55-inch LG OLED55B7V is available for £1,499 and will do a great job too. If you want that cinema experience then get yourself a projector that can show even the most boring of matches in high quality and on the biggest possible screen. Having a projector is a key step towards the ultimate AV setup. What impact would a bigger screen have? Well it would expand the action quite literally and the Sony VPL-VZ1000ES ultra-short throw projector does just that. With 4K HDR laser quality and 2,500 lumens brightness, you’ll feel as if you’re at the cinema watching a movie, so grab the popcorn and a wallet as these are going for around £23,500. With the visuals all set up and taken care of, the next important step to your fantasy football set up is the soundbar. With 64 matches taking place at the World Cup, you can experience the atmosphere of each and every one as if your front room was in Russia. The Yamaha YSP-5600 Digital Sound Projector, at £1300, is head and shoulders above the rest. This offers 3D sound reproduction equivalent to 7.1.2 channels thanks to 44 speakers in that one tidy looking bar. Yes, that includes Dolby Atmos reproduction with 3D surround sound. For the most adaptive, yet slightly more affordable soundbar, look no further than the JBL Bar 5.1 which is available for £699.99 consisting of two speakers that attach either end of the centre unit to offer a wireless 5.1 surround sound. If perhaps that is too expensive then maybe the Samsung Sound+ HW-MS650 could tempt you for £469. For the most insane sound go for the Bang & Olufsen BeoLab90 Ultimate loudspeakers, priced at £58,820 for a pair. While you get 18 speakers in that stunning looking package there are less pricey alternatives available too. Making good use of Dolby Atmos tech is the Pioneer SP-EFS73. The floor standing speakers will make you feel as if you’re at the local pub with your friends watching the game. With three 5-inch bass drivers which provide dynamic bass performance and three way speaker design, atmosphere and commentary will be perfectly balanced. The SP-EFS73 sells for around £750 a pair. You’re going to want to be comfy when watching the footy and there are options out there that can allow you to be a literal armchair fan. Cinema style seating is the way forward and there are options for this. While you could opt for a £15,000 Poltrona Frau Kennedee curved sofa that your mates will likely ruin, there are other alternatives. La-Z-Boy is probably the best bet for anyone looking to sit back and watch the World Cup in their front room. With the La-Z-Boy Celebration Sofa you and at least two friends can literally kick back and relax. With a variety of electrically controlled reclining units, effort is kept to an absolute minimum so you can save energy for cheering. These start at around the £1,449 mark and when you consider that this essentially reclines into your bed too, that’s money well spent. Once you’ve had a great time watching some of the best players in the world with a few mates over, the house will likely end up looking a mess, with only you left to clean up. Look no further than the Dyson 360 Eye, the trusty robotic vacuum cleaner that can be your buddy in the battle of the clean campaign. The Dyson 360 Eye, as the name suggests, has a 360 degrees vision system, can automatically recharge and uses infrared sensors to avoid any obstacles all while sucking up muck with advanced filtration. Add to this a voice control function allowing you to order the Dyson 360 Eye about by talking to it (likely from your position still on that sofa) and you’ll see why it’s £799 well spent.